Update 18 March 2017: I've edited the info about Michael/Barbara concert in Singapore. I don't think it was in 8 April 1985, for Barbara already cut her hair by 6 April 1985. Hence, some premises for this article have been revised accordingly. I have also added some newspaper clippings here and there. I am somewhat reluctant in writing this, but I thought I’d give it a go. 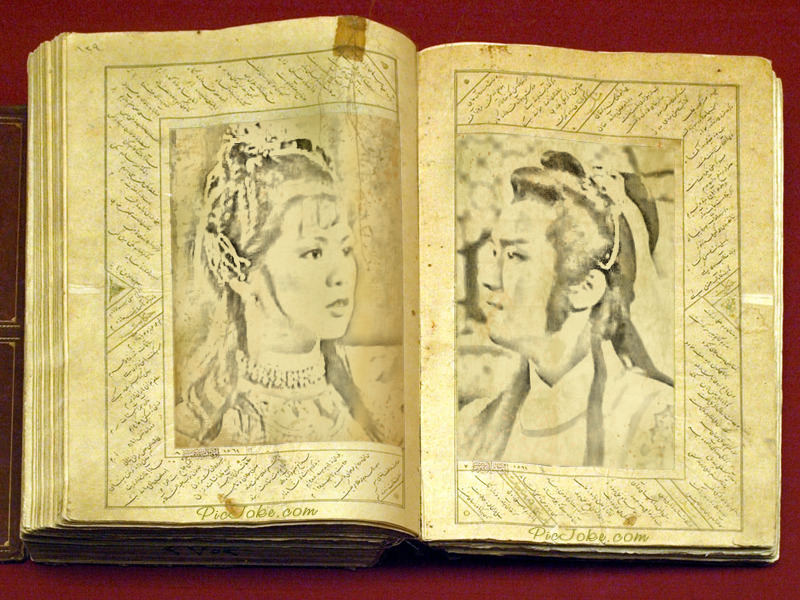 The reason for my reluctance is because bringing up the past can disturb the present. But… I just have to write this. Upon receiving some old photos of MB from Hannah and Cynthia last December and January, I became more certain about one thing: something did happen between Michael and Barbara in 1983-1984, and it was quite big that it almost changed MB’s relationships with their official significant others at that time. Thus, this post is about how I came to that conclusion. 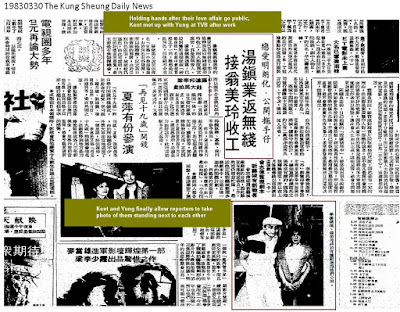 With all due respect to Kent Tong and Jaime Chik, particularly Jaime who has been a very amazing wife to Michael… allow me to write up my speculations here. My premise of this article is that MB once loved each other (or they shared a very strong connection that easily became love, had it given the chance to grow), and that they ended their connection before 1985, the year Barbara died. Of course, I could be very wrong and stubborn and should have not published this article, for MB never had any connection other than friendship. Or I could be wrong on another aspect: that they did have a connection that they later ended; but they ended it in 1985, not long before Barbara died. For me, the best way to explain about my premise is by making a chronology of events involving Michael and Barbara, with Kent Tong and Jaime Chik as well. Again, I respect Kent and definitely Jaime, so I will try to watch my tone to show that I indeed respect them. In backing up my arguments, I will use three sources: 1) photographs, 2) videos/GIFs; 3) Barbara’s letters, and 4) Interviews. Thus, again, this is a speculation, one that non-MB fans will disagree on, but each to their own. I will divide the article into facts and hypotheses. I include photos and videos as facts, and my interpretations as hypotheses. I believe that Barbara Yung and Kent Tong did love each other for several years. 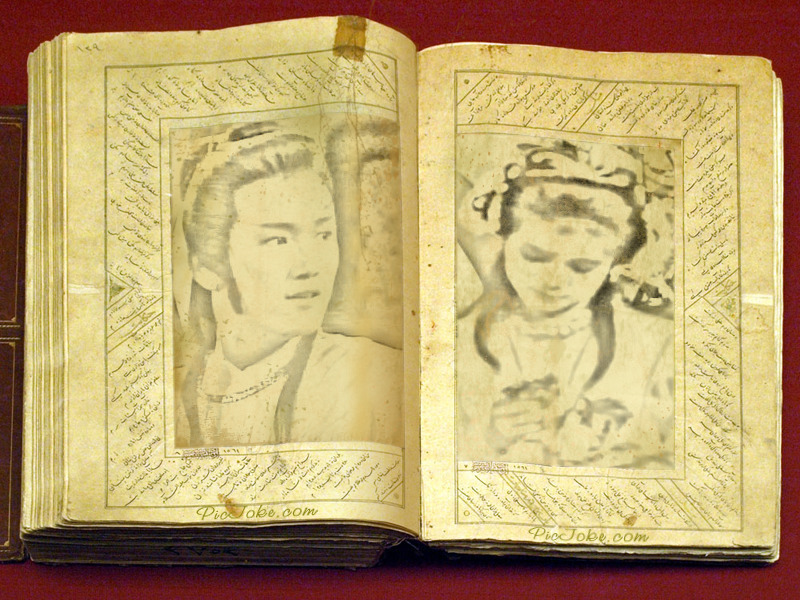 Perhaps from 1982-1983 when they first met in the Legend of the Unknown and afterwards. I believe they started dating when Barbara portrayed Wong Yung part in LOCH 1983. 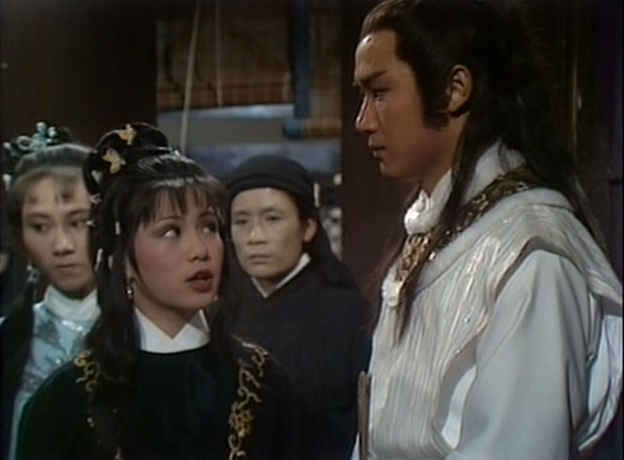 Then in LOCH 1983, Barbara met Michael Miu and Felix Wong as her screen colleagues. 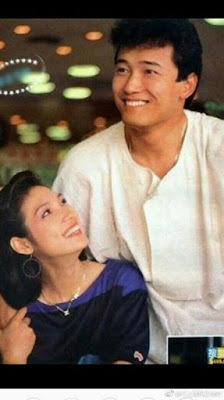 If Wikipedia is to be believed, Michael Miu and Jaime Chik started dating in 1981 (not sure what month), but they broke up in 1982 (again, not sure what month). 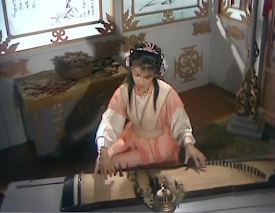 Barbara admitted she had feelings towards Kent Tong. They were seen together day and night. 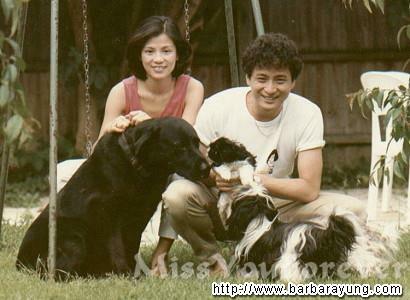 While Barbara’s relationship with Kent blossomed in 1982, she also developed friendship with Felix Wong and Michael Miu. Barbara, Michael and Felix Wong shot the Legend of Condor Heroes 1983; it was a stellar success. LOCH 1983 is still the benchmark of the LOCH heritage, despite it having many artistic license. However, another newspaper dated on the same day (7 January 1983) stated Barbara admitted she didn't have a boyfriend. 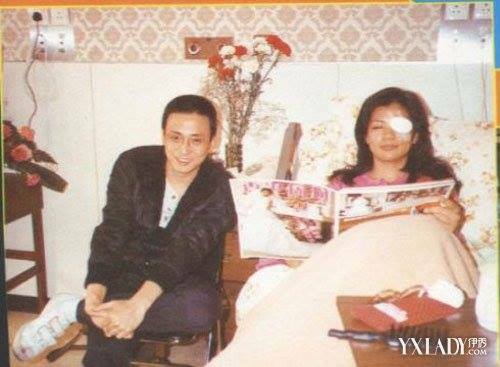 Barbara's left eye got injured on 6 Feb 1983, Kent visited her in the hospital. 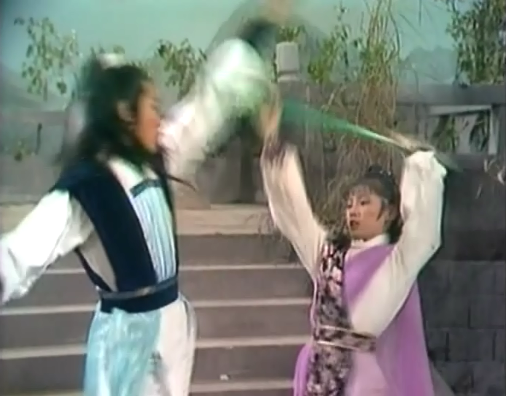 As the result of her injury, TVB decided that all physical fights would be performed by stunts. 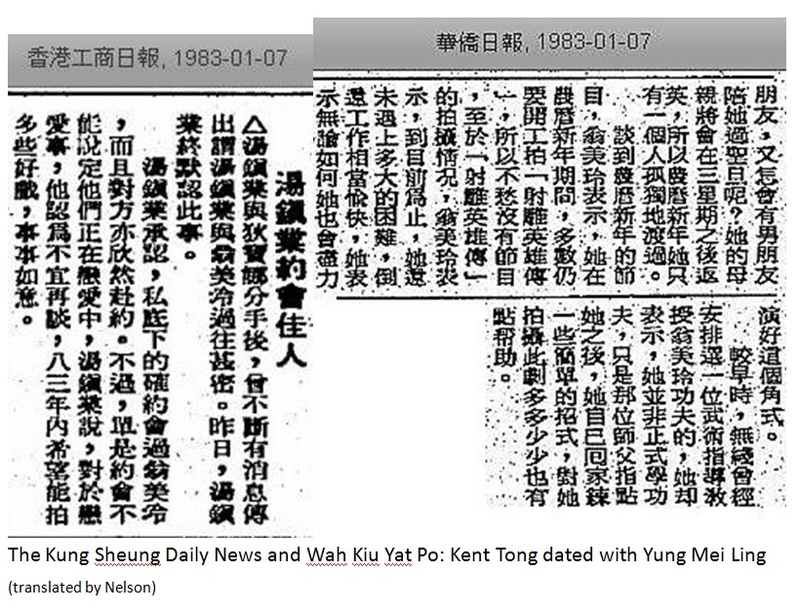 Then on 21 Feb 1983, Michael Miu drove Kent and Barbara to date on the hill. 30 March 1983: Barbara and Kent finally went out of the closet and admitted their relationship. Barbara was definitely friendly with Felix, they looked comfortable with each other. Yet, with Michael, that friendship seemed to be taken a notch higher. The clip below was taken on 22 January 1983 (or at least, that's my take). Of course Felix could’ve swung her from the pier to the boat; but somehow Michael did that, and she definitely didn’t hesitate to take his hands. I think Director Johnnie To et al. did not just obtain an idea from the thin air that Michael and Barbara might be a good screen couple. When Johnnie To et al. decided that MB should be paired in The Foundation, I think they did that because they saw the potentials of the two friends, developed during the LOCH shooting in 1982-1983, as on-screen lovers. 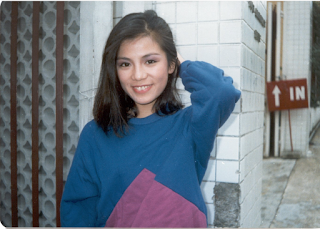 Michael and Jaime broke up in 1982, and then Michael briefly dated the late Anita Mui in 1983 (not sure what month). Not sure what the timeframe was, but in 1983, Michael and Jaime were back together. The Foundation 1983 was filmed. Barbara, Kent, Michael and Felix starred in the series, but Barbara did not have any screen time with Kent. Given the popularity of Barbara’s Wong Yung and Felix’ Kwok Ching, it’s possible that Johnnie To et al. actually paired up Barbara with both Michael and Felix in the Foundation (aired in 1984) just to test the waters for future series. However, turned out that the audience loved MB’s Li Sai Man and Chun Sik Sik (although we know LSM killed CSS in the end). Hence the producers made an executive decision: pair up Michael and Barbara for other projects as well. People like them, and they were actually good friends. Along the way, Barbara’s friendship with Michael grew. I can’t help noticing (of course) how Barbara leaned very close to Michael in the gif above. Three days after Barbara and Mrs Lee Heung-kam became god-daughter-god-mother, from 15 May 1984 for 10 days, Michael and Barbara had a stage tour, as per her May 1984 letter. 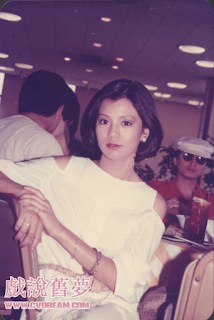 Here we have set of photographs of Michael, Jaime, Kent and Barbara at a cafe at the Hong Kong Kai Tak Airport, taken on 15 or 16 May 1984. 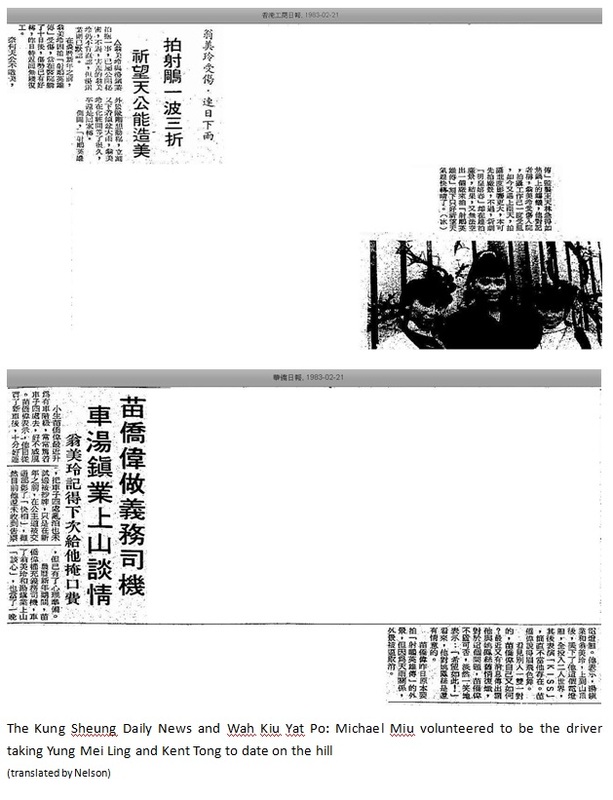 I found the newspaper coverage below from Rob's website. The photographs above were indeed from 16 May 1984. So,Michael and Barbara went to Malaysia (part of the 10 days tour, I gather); Jaime and Kent went to the airport to see them off. Barbara and Kent did have an argument, but then Kent relented and hugged her. Michael then further comforted Barbara. The last photograph showed the character 離, which I think was part of the 離開大廳 sign or the Departure Hall of the Kai Tak Airport. This photograph is one of the famous MB photographs that showed how Michael cared a lot about Barbara. Here, Barbara obviously just finished crying, and Michael consoled her. Okay. So now I know that Barbara cried because of Kent (not blaming either of them here, just saying...). Then Michael comforted Barbara as well. That might lead to Jaime being uncomfortable in the photo above. I also think that the first photo of Michael (in white) and Jaime (in blue) in this May 1984 section was taken before Barbara and Kent arrived. Jaime didn't look comfortable in the last photo above, but she looked very merry in the first May 1984 photograph. Theoretical jealousy aside, it would be easier for Jaime to be happier before the row between Barbara and Kent took place at that Kai Tak café. Also, although this newspaper piece below doesn't make a lot of sense to me (that Barbara cried because MJ were being sweet to each other), it does support the theory that the first MJ May photo here (where Jaime was all smiles) was taken before the Barbara-Kent row. Barbara and Michael sang together in the concert, possibly in Malaysia. One of those songs was “In the Rain”. According to an article at Rob's website, eyewitness Imela said that, because “Ah Miu” was so tall, “A Yung” (Barbara) had to look up almost 90 degrees to see him. Vice versa, when she called him, he had to look down almost 90 degrees to see her. I am inclined to think that Michael and Barbara actually sang three songs in the concert. "In the Rain" where Michael wore a sailor's hat and Barbara wore a gorgeous white dress, the Foundation song (Barbara wore her Chun Sik Sik dress), and also another song where Barbara changed into a navy blue suit (she would not have time to change into a new dress in the same song). What are the last two songs then? 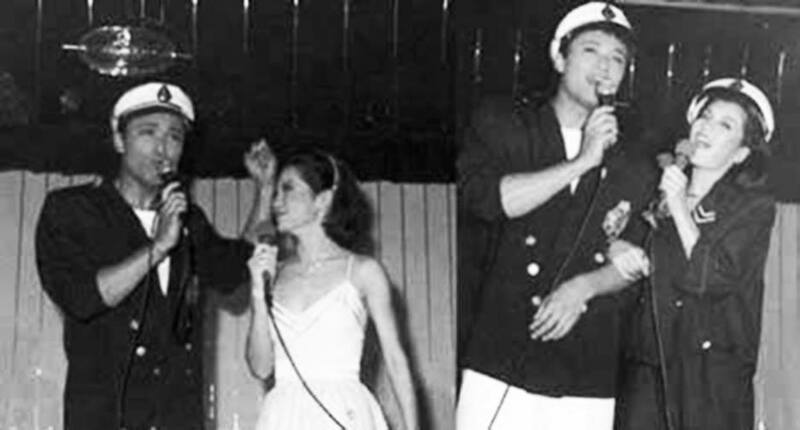 Unless she only sang two songs with Michael: one the Foundation song, and one "In the Rain", where she also donned a sailor hat and a navy coat over her gorgeous white summer dress. By the way, Imela's article gave the impression that "Ah Miu", whoever this Ah Miu was, was in the Singapore April 1985 concert with Barbara. 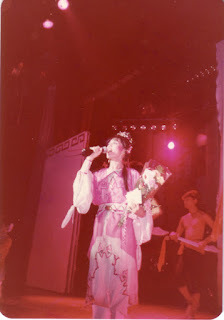 But, considering the concerts happened more than 30 years ago...,it's possible that Imela might have mixed the two concerts up (the May 1984 and April 1985). Barbara and Kent visited UK together in June 1984. Right after the UK visit, Barbara started shooting CLH with Michael. If the photos above were indeed taken in the first half of 1984, perhaps in May 1984, whatever problem Barbara had (perhaps with Kent) was temporarily solved. Barbara and Kent went to UK and they seemed to enjoy their visit there. 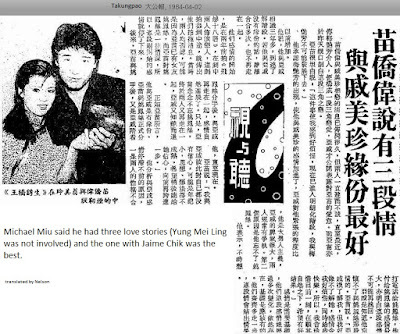 Newspapers started covering Michael's and Barbara's new series Chor Lau Heung. Barbara and Kent attended a wedding in October 1984, so she was still with Kent that time. However, Barbara's letter 27 October 1984 had a subdued tone. 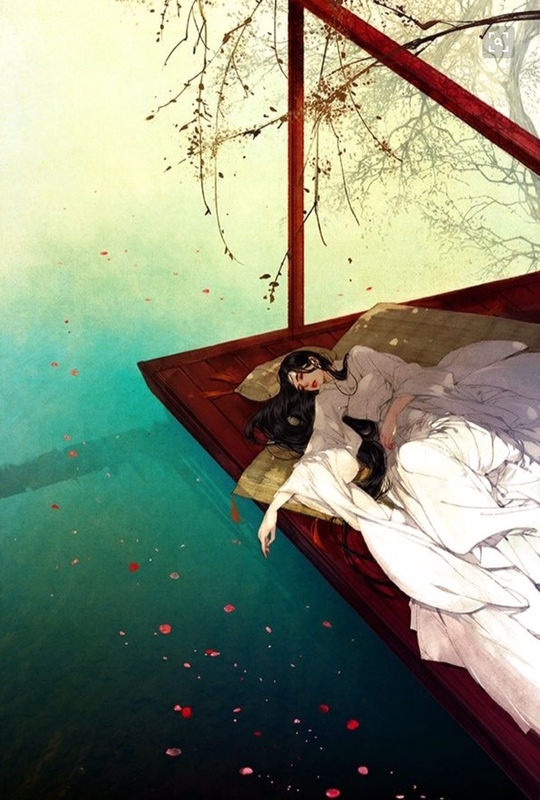 I'm tired and irritated recently, probably I began to suspect my feeling after seeing fortune teller. 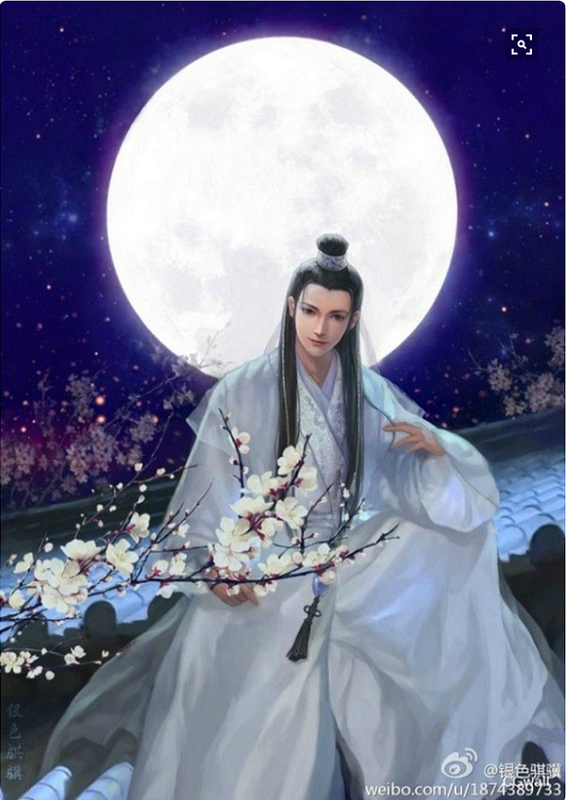 I don't know if I just borrow trouble at that time, they said I'm sentimental, but I know my analysis is correct. It's just a struggle between sense and sensibility. Kent is very kind to me. So what can I do to a man who didn't do anything wrong, only let it go naturally. 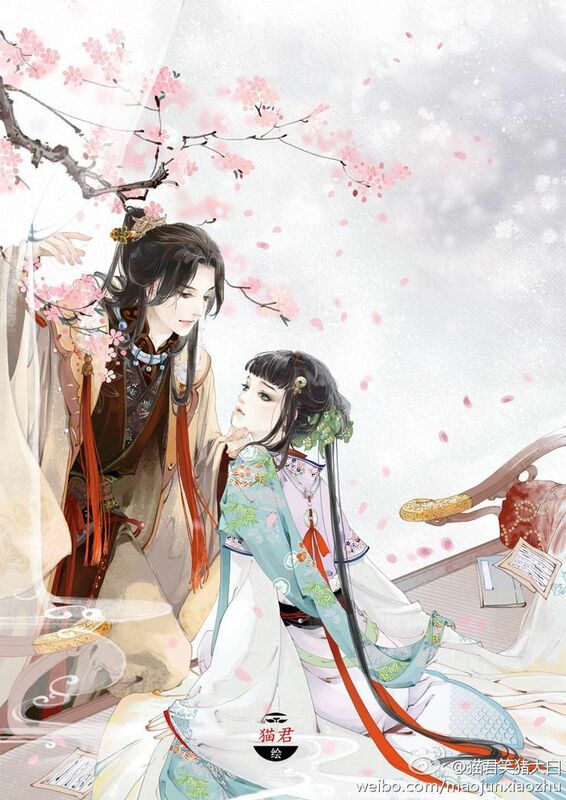 Wish I'll be happy under the arrangement of the fate. If Barbara was talking about Kent loving another woman, her tone would be different. She would not include “I began to suspect my feeling after seeing fortune teller” in the letter. My take? That Barbara started to realise that Michael was more than a friend for her. However, Michael was dating Jaime at that time, and Barbara was also with Kent, despite the ripples and waves in her relationship with Kent. CLH started airing in November 1984. 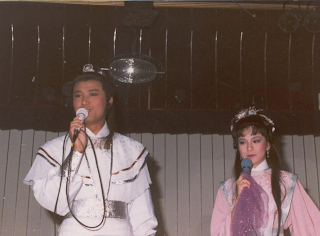 On 4 November 1984, Michael and Barbara attended a CLH signing session with Cecilia Fong (who was she in CLH? ); MB were as always close there. Michael said that he only loved Jaime on 11 November 1984 (source is Rob's website, but I lost the link, hence link TBA). Barbara was chirpy in her letter on 27 November 1984, so I think she was buoyant in those days despite her reflective letter in October 1984. 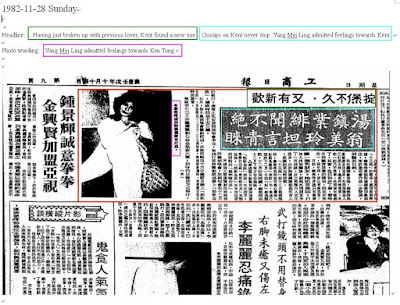 In December 1984, the CLH closing ceremony was held, and MB were very close there. I find the way Michael looked at Barbara very intriguing. Then we have a newspaper article from 5 Dec 1984 stating that both Michael and Barbara "had a clear conscience" in terms of the rumour that Barbara was pursuing Michael. It seems the interview was conducted during the CLH ending ceremony, cos Barbara wore the same white scarf, and Michael's suit was similar to the suits he wore in the photos above. I see that Michael and Barbara had been giving interviews that they were just friends. I believe it when Michael said so in April 1984. But I question the use of "a clear conscience" there. If they were really just friends, they could just say so. "I love Michael/Barbara as a friend." But since 'conscience' was used, it could be that they realised both of them had partners, hence they controlled any affections between them, in respect to both partners. My premise of this article is that MB once loved each other (or they shared a very strong connection that easily became love, had it given the chance to grow), and that they ended their connection before 1985, the year Barbara died. As I have admitted before, I could be wrong, in the sense that MB never shared anything other than friendship. But, then, after shifting through some contradicting news, I still believe that their connection was deeper than friendship. 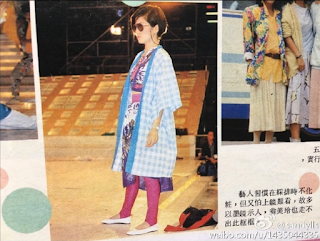 In January 1985, Barbara and Tony Leung had some "Rough Ride" photoshoot. She looked happy. 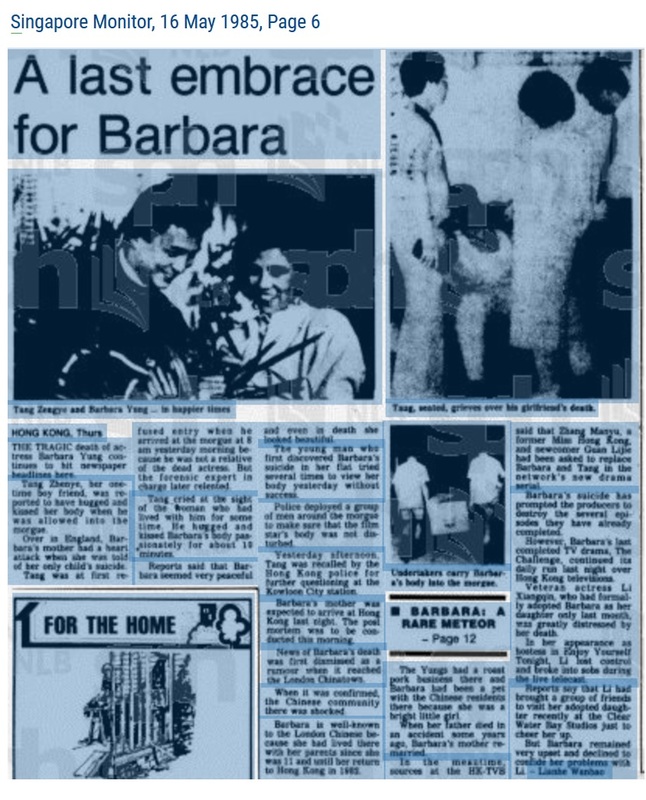 In Feb 1985, Barbara had a tour in Thailand with Felix Wong. She looked happy. In March 1985, Barbara had the Rough Ride ceremony with Tony Leung (the end of the filming?). She looked happy. 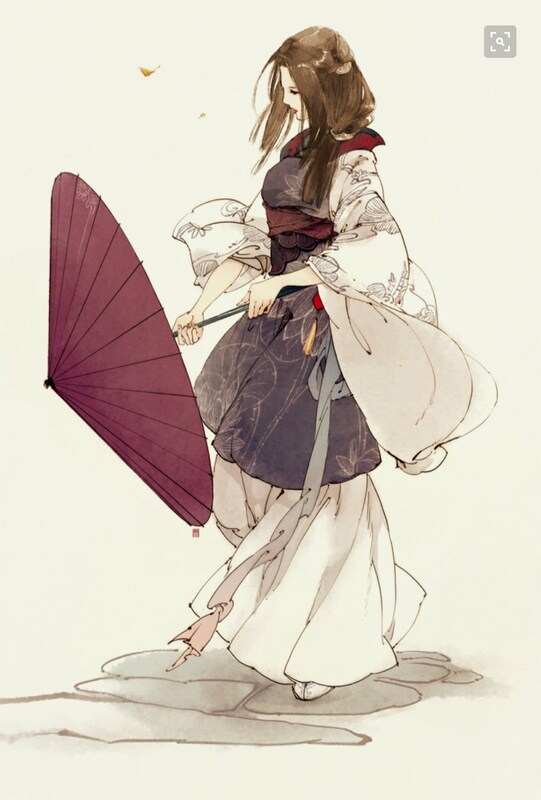 Her hair was still shoulder-length. Then two months later, she had a concert in Singapore on 8 April 1985. The first time I posted this article, I believed that Michael joined Barbara in this concert. That was because the eyewitness account (Imela) mentioned Ah Miu (阿苗), which I thought to be Michael Miu (苗僑偉) in her statement in Tieba Baidu. 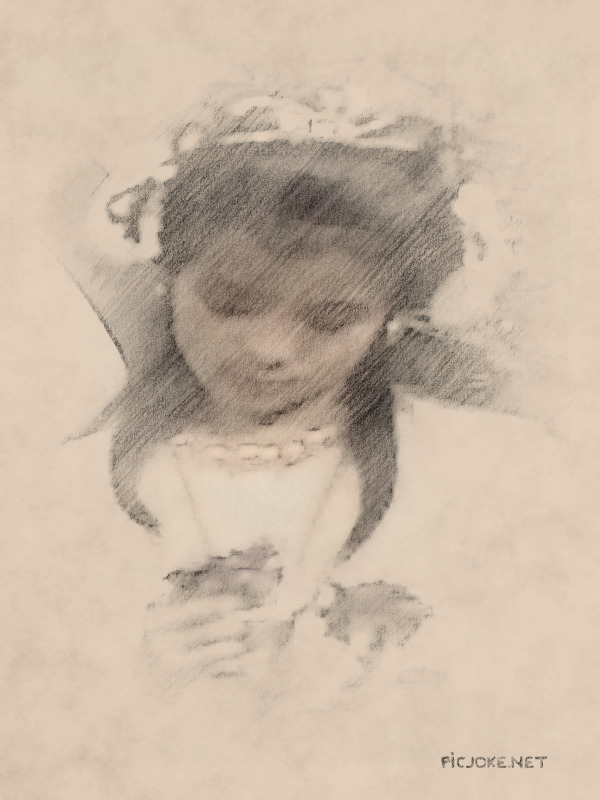 But now (18.03.2017), after examining Barbara's hairstyle in May 1984 and on 6 April 1985, I have to revise my statement. Michael and Barbara had a concert together in May 1984 (either in Malaysia or Singapore), not in April 1985. Anyhow...Barbara sang, among others, the Chor Lau Heung opening theme in the 8 April 1985 concert, and she wore her Siu Ching pink tunic (she wore when SC met CLH again in Ep 15 after he got injured). Barbara's only letter in 1985 that we can access was dated 11 April 1985; and the letter was buoyant, happy. How are you doing? I have been back to Hong Kong. My performance in Singapore is over. Beside the performance, I also stayed there for 2 days to visit the city. Well, I have to come back Hong Kong to work on the play, otherwise, I would rather stay in Singapore than come back to Hong Kong. It was a really happy trip to Singapore. In Singapore, I also bought a pair of earrings for you (her mum). Hopefully, you will like it. I heard that the little brother (I guess her relative) is going to UK in May. I will ask him to bring the earrings to you. Is Shela's new baby a boy or a girl? How about we make a bet? Actually, the more kids in our family, the better. It is better to have more noise( people) in our family. I believe I should be able to see the new baby by the end of this year. However, Chunxia ( her niece) is still my favorite baby. That is it. Now I have to go back to the studio to work. Wish you all happy and harmony. Mum, you should take care of yourself. 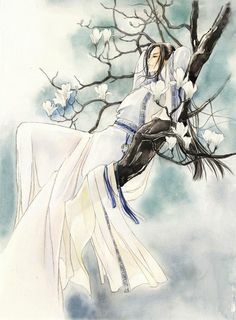 I am fine here, don't worry about me, please say hello to Stepfather. 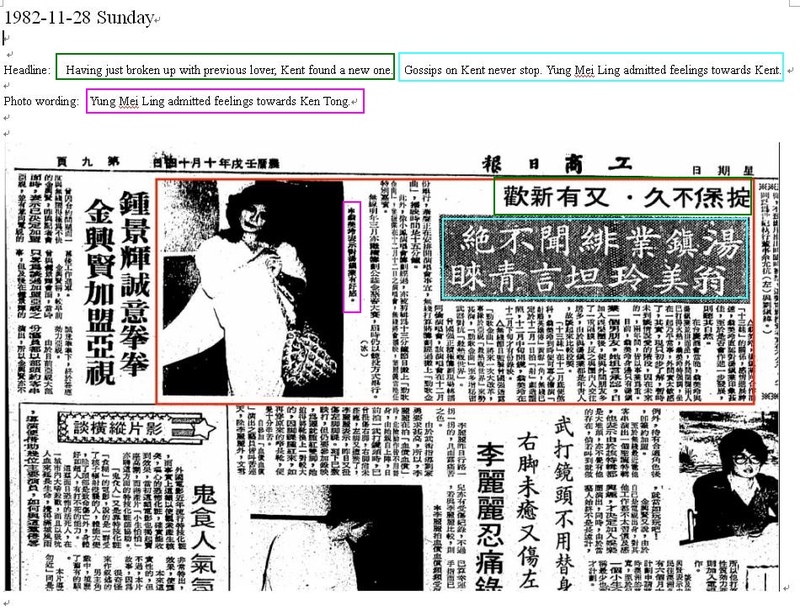 This 11 April 1985 letter was buoyant; it showed me that she was happy in Singapore. Well, as much fact as a newspaper coverage can be... but on 2017.03.06 I saw for the first time an article that talked about Jaime's jealousy towards Barbara. The article was found at Rob Radboud's website. I don't know how legit this article is, as in, whether Jaime really said that. I can't read traditional Chinese characters, but I will try to find a person to translate this newspaper. We know Barbara did say that Jaime misunderstood her in the 13 May 1985 interview. 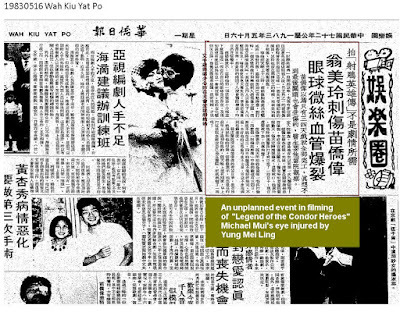 Now that I have found this article, dated 10 May 1985, it means that this article might have prompted Liang Pui-yee to ask Barbara about Jaime (scroll down below). If Jaime did say those words, it might mean that Barbara might have said again about how Jaime misunderstood her a few days prior. I don't think though that Barbara said that in malice. As Hannah pointed out, Barbara might just have replied to questions from reporters again and again, trying to explain to them why Jaime was understandably jealous. To Jaime though, this repetition amounted to Barbara not being able to move on. 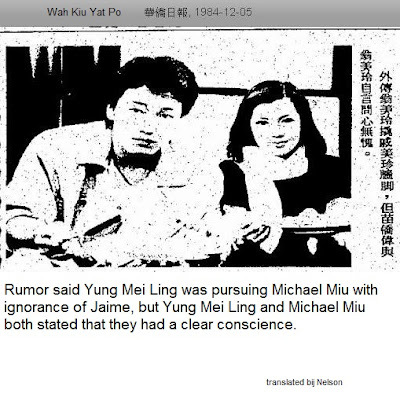 I originally didn't get it why Liang Pui-yee brought up the Michael-Jaime topic in his last interview with Barbara. 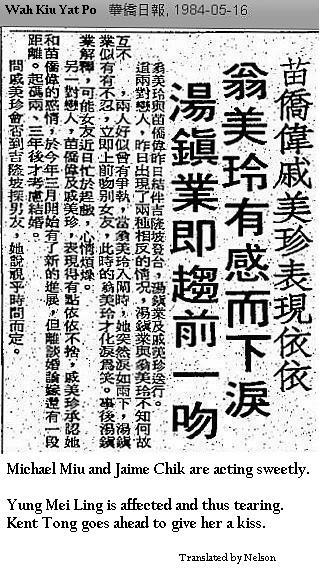 This 10 May 1985 article about Jaime clarified it. If it's true that Jaime made this comment, I can understand why she burst into tears in Barbara's funeral on 19 May 1985 (see below). But one thing that is still not clear to me: Why did Jaime make such a statement, if she did? What triggered her to say that? Was there a recent newspaper article about Barbara commenting about how she (Babs) and Michael were not an item? 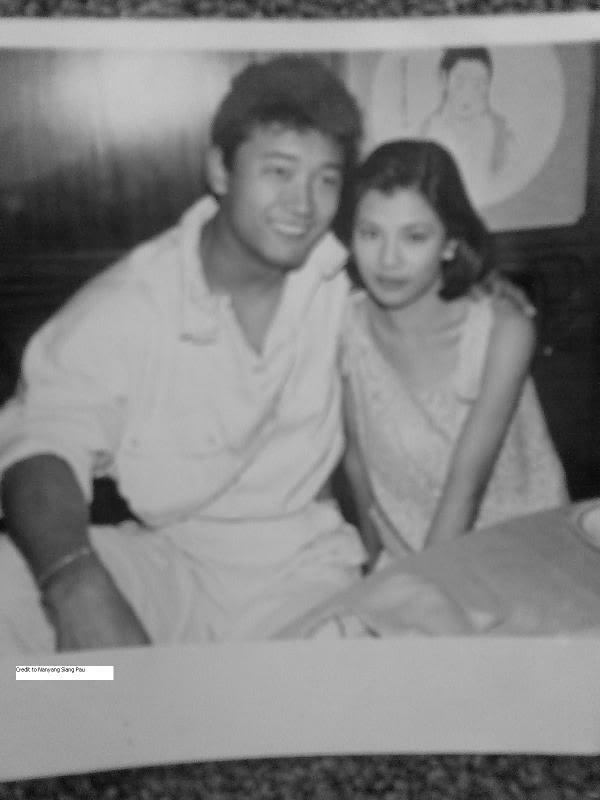 Kent Tong was seen swimming with Sandra Ng. Just over a month after her buoyant last letter, we found Barbara in a very different situation. 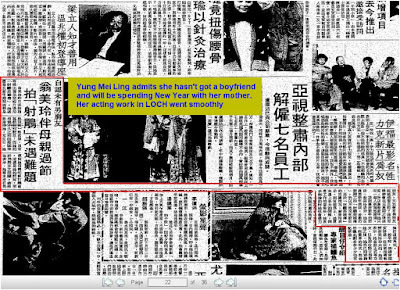 In Barbara’s last interview with reporter Liang Pui Yee 梁佩仪 just before she died, the reporter showed a photograph of Michael, Jaime, Kent and Sandra Ng hanging out together. Liang also mentioned about Jaime Chik being jealous, and Barbara did confirm that. However, Barbara said that the misunderstanding happened ‘a long time ago’. 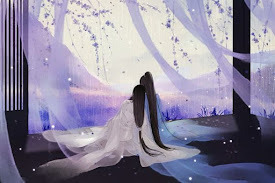 I [Liang Pui-Yee] kept silence for a while, she came back to the living room from kitchen and said: "It's not a big deal, I had no time to stay with Kent, he had fun with his friends, we're like that most of time...and...even if I didn't need to work, I wouldn't go with him, because I don't like swimming.". I told her: "Other people saw Kent swimming with another actress, they just think you broke up with him and they are a couple now." Barbara said: "Let it go, I have no idea about it. 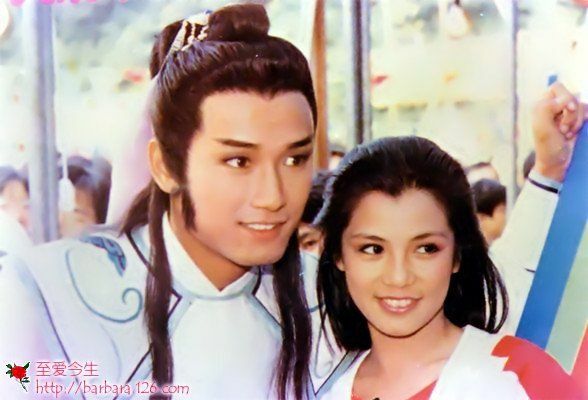 They said I was with Michael Miu before, it's nothing with him actually, I have been okay with those gossip." I asked her again: "You and Kent are really not close like before?" Barbara looked at the cup in front of her, said slowly: "It's difficult to talk about it, I tell you, we are good just like before, but too many things happened on me with gossip. Sometimes they say I steal this girl's boyfriend, sometimes they say I steal that girl's boyfriend. I don't know how to deal with it, maybe because I look outgoing and cause all the misunderstanding." I asked: "You mean Jaime Chik?" Barbara answered: "Oh...it's long time ago, she did misunderstand me because she thought I would be with Michael Miu...well, it's impossible for me to do that." "If she told me directly not to get close with Michael, I would feel better...But she just complained behind my back, I feel very uncomfortable." She looked solemn with a deeper lower voice: "I have felt annoyed and perplexed recently, the relationship is getting me nowhere...I tried to find spiritual sustenance in work, but I couldn't..."
I asked: "Don't go further between you and Kent?" 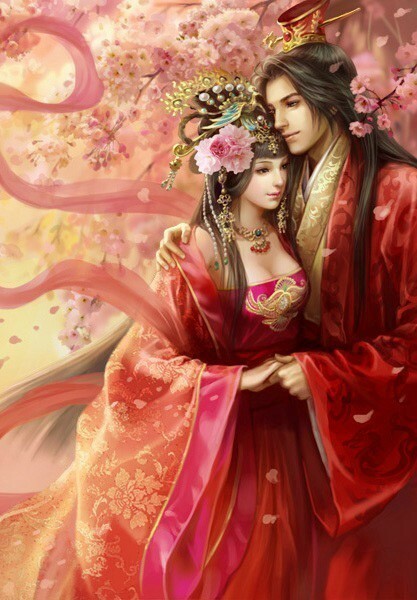 friction(disagreement) between us has increased." 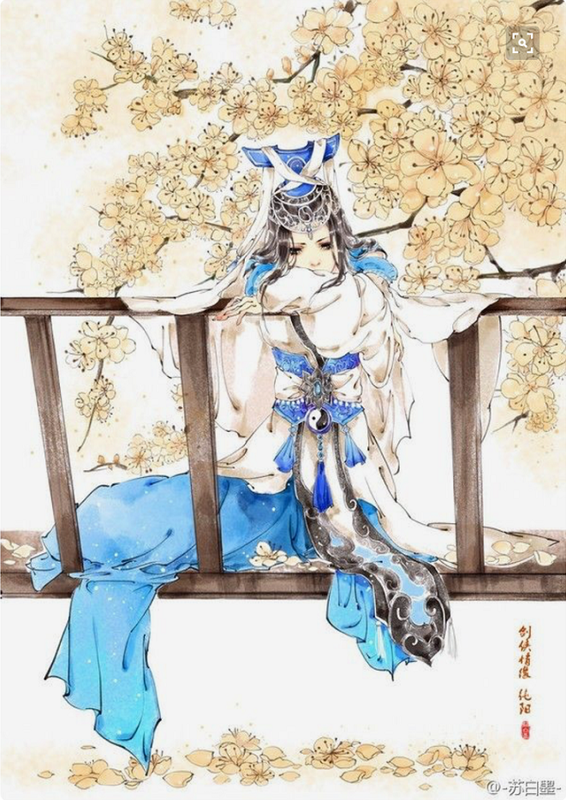 Barbara said: "All daily trivial matters, maybe we have been together for long time, know clearly about each other's shortcomings, quarrel happens inevitably...maybe it's destined I and Kent can't be together." During the interview, Barbara said "Oh...it's long time ago, she did misunderstand me because she thought I would be with Michael Miu...well, it's impossible for me to do that." I don't think that it was impossible for her to be with Michael because she and Michael did not share anything romantic or deeper than friendship. I think it was impossible because Michael had a girlfriend and Barbara was also with Kent. Michael was a good person. 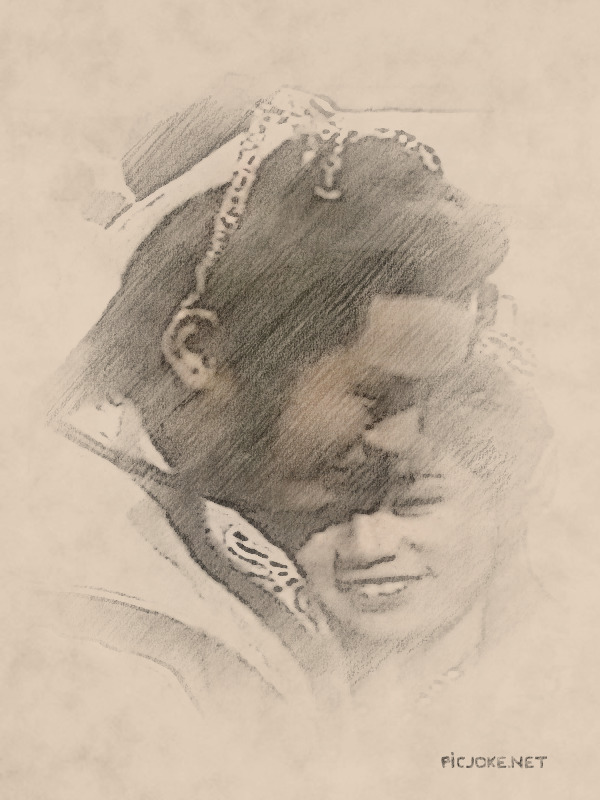 If us crazy MB fans are correct about the unfulfilled MB romance, he would never admit this possibility to the world. 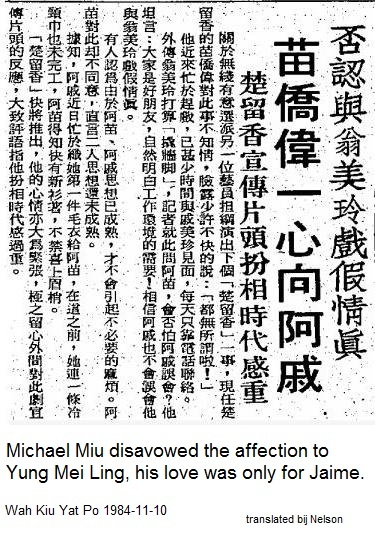 Michael Miu is a person who wouldn't take his friend’s girlfriend. He wouldn’t leave his girlfriend either. Hence, Barbara and him distanced each other. Or perhaps Michael distanced himself from Barbara. This severance led to Barbara being lonely, because all this time, whenever things went bad with Kent, Michael was there for Barbara; his shoulders were there for her to cry on. Plus, given that Barbara only knew Michael from 1982, her ‘long time ago’ seemed to be quite plastic… To me, Barbara downplayed the importance of Jaime’s jealousy (and hence, Barbara’s connection with Michael) in this interview. Since the Kai Tak Airport photos were taken in May 1984, and Jaime was jealous at that time and voiced her objection to her friends afterwards, then the 'long time ago' would have been just one year. (please note that I do respect Jaime, and I wrote about this not with malice towards her). No one would have guessed that. We know this sad day. 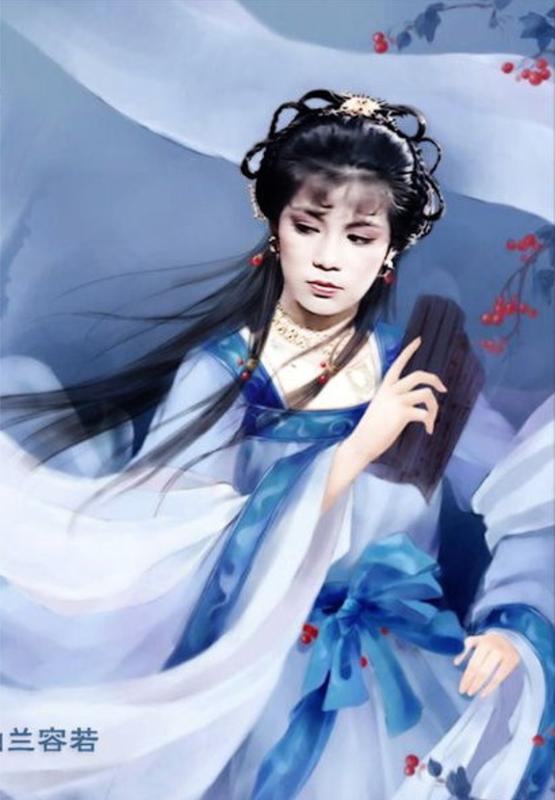 Barbara Yung died. 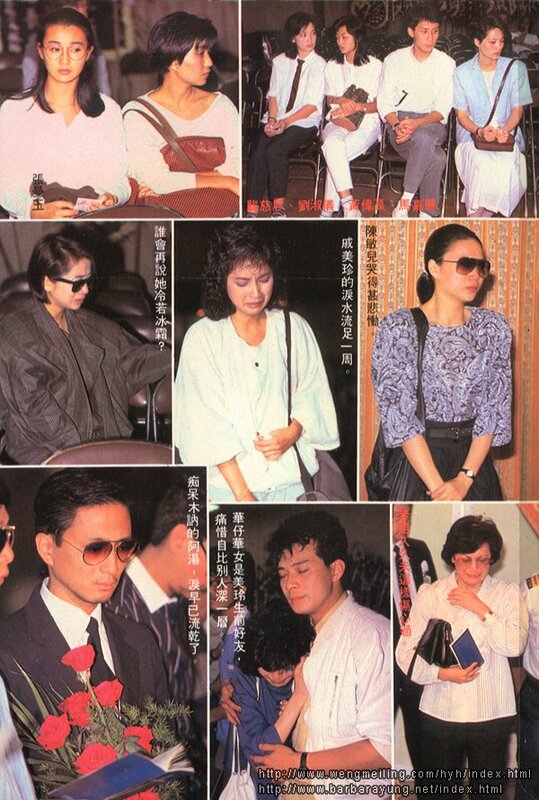 Michael Miu, Kent Tong, Felix Wong, Andy Lau, Tony Leung etc were devastated. What I didn't know until this morning (2017.03.07) was that not only Kent Tong rushed to Barbara's apartment the morning she was found dead; Michael Miu also rushed there. Michael then also accompanied Kent to the police station. Read this article I obtained from Rob's website. It's not long; the layout was just uncomfortable to read. 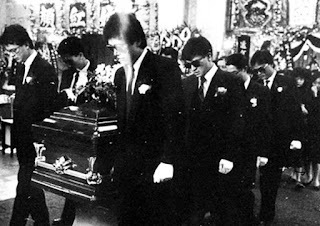 What I also didn't know was that Mrs Liu (Barbara's mother) was absent from the service, but that was because of the belief that a parent should not attend his/her child's funeral. I also didn't know that Michael (and Felix and Andy) broke down in tears during the service. Michael's eyes were misty as he told the reporter that he and Kent Tong actually went to a shaman after Barbara’s death. He and Kent wanted to bring Barbara back from death, a la Fearless Duo. Though I can't understand the majority of the interview, I know for sure that Michael said that Barbara (the soul) did appear and said to Kent, “A Jai, it’s very cold here…” (this is soooo sad…). Michael was definitely tearful back then; and I think he several times had to pause to control himself. Given Jaime Chik's devastation during Barbara’s funeral (and I am certain she was shocked when she learned that Barbara died), if it was true that Jaime was jealous of Michael’s closeness with Barbara (and I think she was), Barbara’s death made Jaime examined her attitude to Michael. If it was true that Jaime did say what she allegedly said in the interview on 10 May 1985, commenting that Barbara couldn't move on from Michael, then Jaime must have been wracked with guilt during the funeral service. I feel that Jaime regretted her jealousy to Barbara. Had she not been so jealous, had she let go of Michael, or at least give Michael time to be with Barbara when Barbara as a friend needed Michael, perhaps Barbara would not be so lonely. Of course at the end of the day, as I said in my previous post, Barbara’s own happiness was in her own hands… but I wouldn’t be surprised if Jaime thought of the “had I been nicer…”possibility during the funeral. 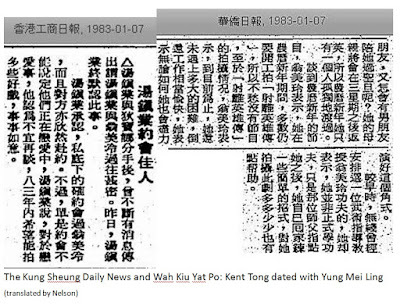 In 2012 Michael Miu finally opened up that Barbara had broken up with Kent Tong a good few months before she died. 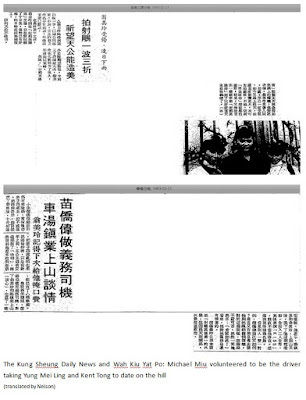 The interview with Liang Pui-yee stated how Liang advised Barbara to “say goodbye to [Kent]”. In 2014, Kent said that Barbara tried to contact him the night before she died. 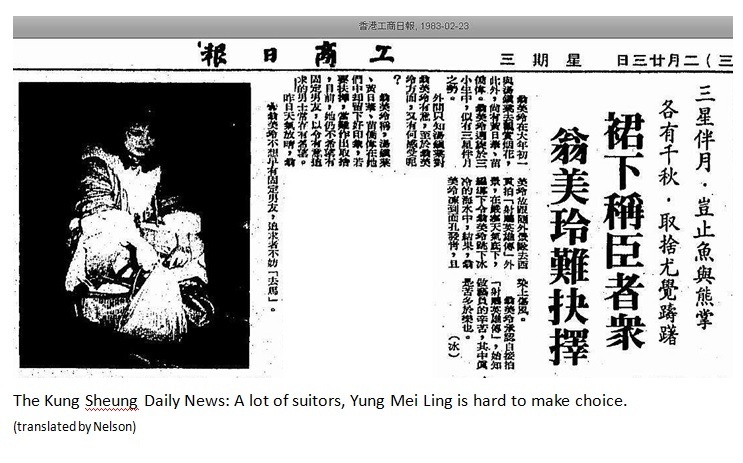 She might actually try to follow Liang Pui-yee’s advice. Barbara wanted to talk to Kent Tong so she could let him go. Also in 2014, Kent said that Michael "is a perfect guy". I do not judge Kent for breaking up with Barbara. Yes, they had problems, but I think it was because they were not mature enough to be together. The photo of him holding Barbara at the airport (in the 1984 section above) showed he did care for her a lot. He might not be mature enough to be with Barbara, but he was a good guy nonetheless. Barbara said as much in her 27 October 1984 letter. Plus, Kent's comment that Michael "is a perfect guy" makes me think that the notion that Michael distanced himself from Barbara out of respect to Jaime and Kent is plausible. 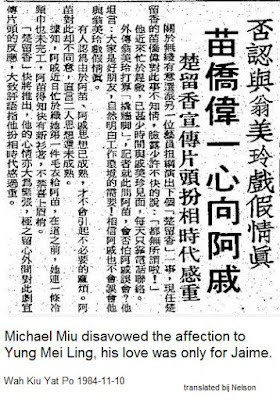 If Michael indeed gave a statement that he "had a clear conscience" on 5 December 1984, then it is very plausible that Michael Miu actually controlled his affections to Barbara out of respect to his girlfriend and dear friend. Did Barbara still love Kent before she died? I think so. She still hadn’t accepted that Kent and her were over (although she said otherwise in her last interview the day before she died). Not necessarily. 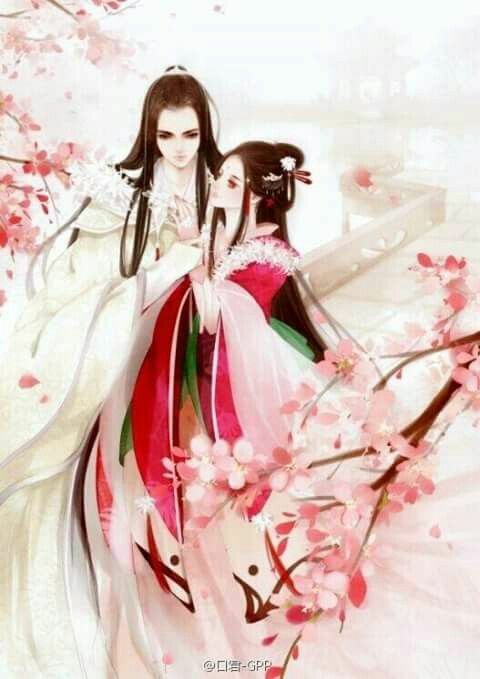 A person can love more than one person at the same time. This can happen with the person barely realizing this fact as well. However, I don’t believe she never loved Michael, or that her connection with Michael was just a friendship. Her photos with Michael showed that she was not only happy with him; she was glowing, and she was close to him. To me, there’s no denying that Barbara was in love with Kent. But her glow and shines whenever she was with Michael can mean only one thing for me: Michael was a very important person for her. More important than Felix, for although Felix was a dear friend to Barbara, her body language was not as intense as when she was with Michael. Barbara's photo with Felix in February 1985 showed that they were close, but not as close as she was with Michael. I believe that Barbara had a deeper connection to Michael than she would admit to the world. She might have almost said that in her letter 27 October 1984, but she never did. Yet the way she looked at Michael and held his hand during their duet didn’t say that “he was just a friend”. We know that Barbara was an important person for Michael in the past. But how important was she to him? I have no doubt that Michael loves Jaime Chik. 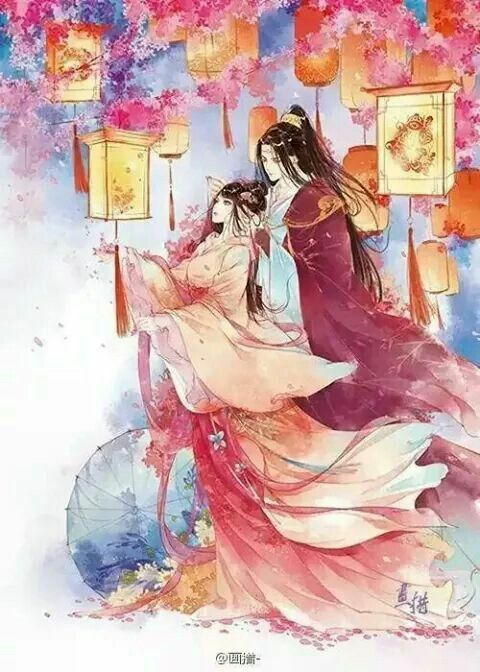 I have no doubt that they have problems in the past, but they also overcame the problems together and emerged stronger and more loving. I think the next five years after Barbara’s death was important years for Michael and Jaime to re-examine their relationship. They concluded that trust was everything, that even though Michael was naturally a flirtatious person, he was also a loyal person, and that Jaime decided to take Michael as a whole package, including his natural tendency to charm people. Michael OTOH also appreciated Jaime’s willingness to understand him, and thus decided to appreciate his relationship with Jaime. In 1990, Michael married Jaime Chik, and I think he really loved her ever since. However, I think Barbara was very, supremely important for Michael in the past, and she still holds an important place in his heart. 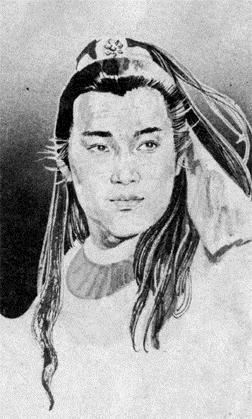 During his interview about him and Kent Tong visiting a shaman to resurrect Barbara, he had to stop several times to compose himself. I’m not sure when the video was filmed; was it in 2011 or 2010? Let’s say in 2010. About 25 years after Barbara’s death, Michael can still be emotional when talking about Barbara. This emotional display tells me that Barbara is still a very important person for him. I do think that over the years, Michael had learned to let go and accept what happened. He just had to; as we all just have to. But it took him decades to do that. Later on 26 May 2015 he was interviewed again about Barbara, he was more cheerful as he recalled the days of the LOCH 1983 shooting when Barbara accidentally hit his eye with the Dog-beating Stick. When the hosts ended the show later, they sang “Who Can Change” with Michael, and he was rather jolly when he sang the song. 2) Michael didn’t tell the truth, but he did so out of respect to his wife Jaime. I am, not surprisingly, in the second camp, but I accept my very slim probability of being correct. 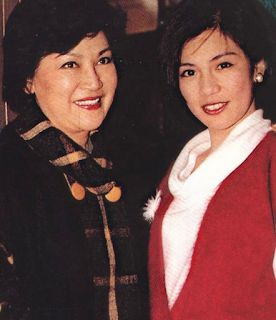 Perhaps, Michael Miu told the truth: that he always treated Barbara Yung as a dear friend, with a bromance between them, and that’s that. 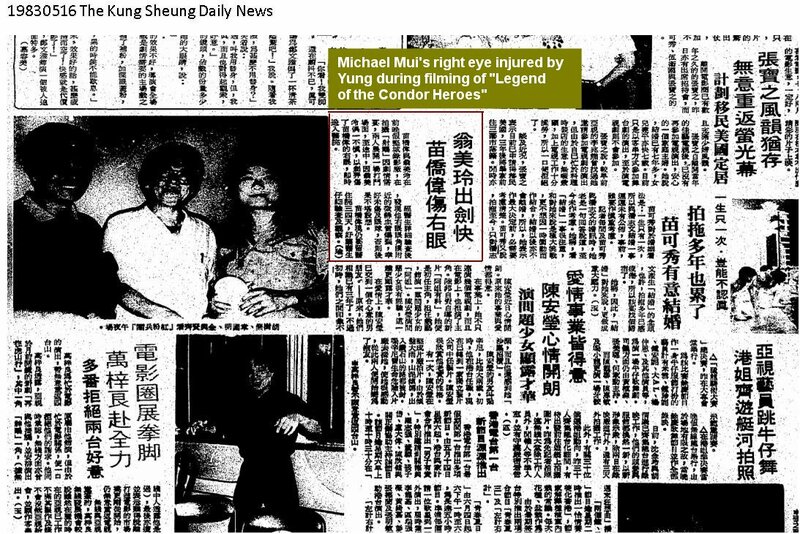 But perhaps, Michael was understandably protecting Jaime’s feelings and thus never admitted to the public that he once had a deeper connection with Barbara Yung. 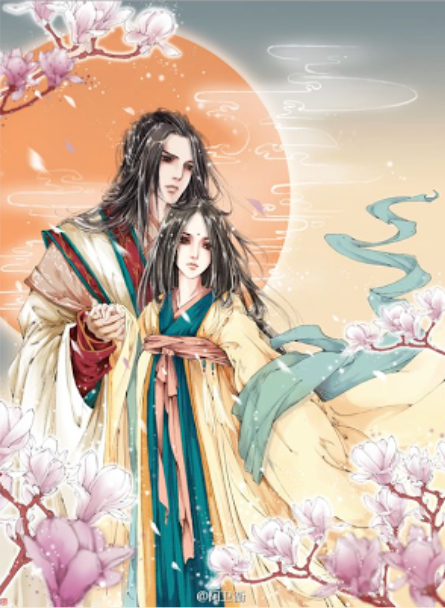 Really good blog about your thoughts on MB relationship. I do believe they started off as very compatible friends..and i really believe if given enough time. 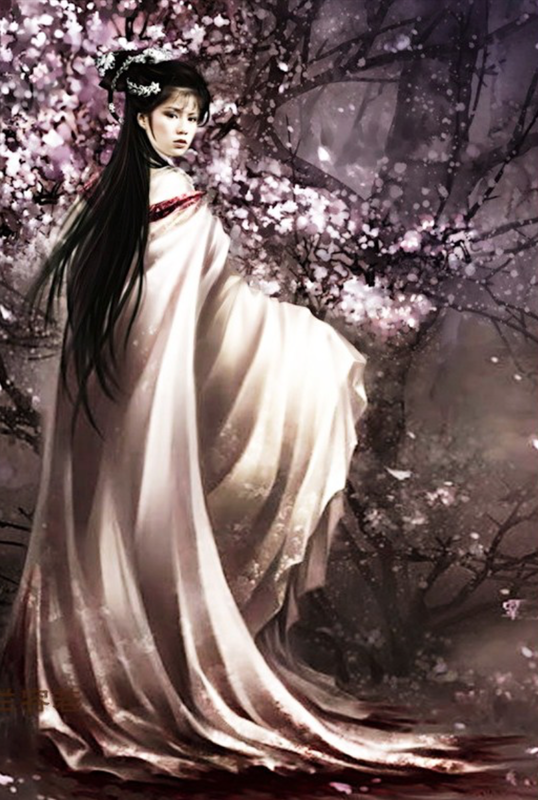 .. it would have blossomed into something more. Watching that short clip of M helping Babs off the stairs... the stairs goes down more, she could have walked down and then just needed slight help stepping over off the boat thing, slight as in just a hand to hold to step over, but instead, in the middle of the steps, she comfortably lets M carry her down when she was midway. And with so many crew members working ... any one of them could have helped Babs down, its their job to oversea the actors and make sure they are safe. I also feel you were totally on the ball when you mentioned that people there, including the director, saw something in M and B and that is why they cast them as a couple there after..again and again...AND again. Like how we can acknowledge that she did indeed love Kent too....and its normal for relationships to fizzle out or change as time goes by. I LOVED your ending you wrote "For if he loved Barbara less, he would be able to talk about it more..." This is sooo true, as it has happened to me too. I am so sure that I am not the only one. Miss Babs so much! 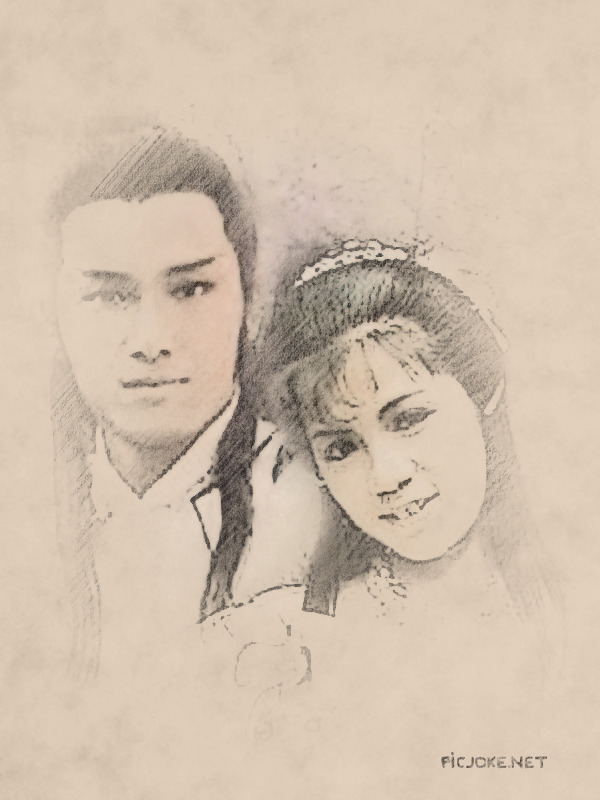 Thanks for this blog Icha, it was done in a very sensitive and thoughtful way. Unspoken thoughts of so many who feel the same way. Thanks a lot for your comment, Hannah! Hi Anon, thanks a lot for the comments. And then there was Jaime too, so that would prevent him from ever admitting his feelings to Barbara. Having said that, I think Michael might not realise how important he was to Barbara as her lifeline until her death. Michael was the first close friend (other than Kent) who arrived at the hospital/morgue/police station... even just to think how gutted he was back then makes me sad again. Michael paid (or partly paid) the Memorial Tablet for Barbara in HK... she was that important for him. About Jaime, I have no doubt that those were not fake tears. I think she truly regretted her negative comments about Barbara on 9 or 10 May. I bet she was also regretful of her failure to manage her jealousy. 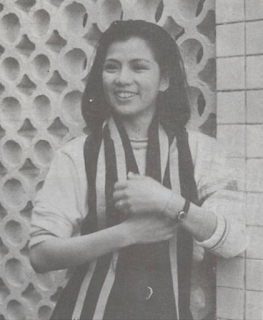 I think Jaime was indeed jealous, the airport photo in May 1984 showed as much. 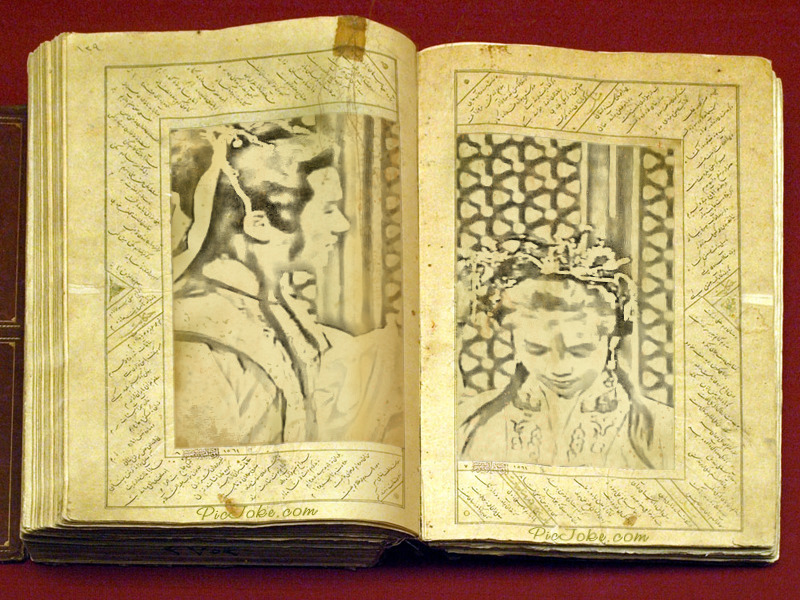 However, she also regretted those jealousy, and I bet she also wished she had managed the events wiser. Michael wouldn't be with Jaime for this long if Jaime kept being a jealous person. Jaime changed into a tolerant person after Barbara's death... that much I'm certain, and that's just from me seeing her crying photo. I really hope that Michael & Barbara would had gotten a chance to be a couple. But from the outside looks, I think Jamie would had been a better wife for Michael. I agree for most of your hypothesis, Icha. We all deeply miss Barbara's smile. And keep haunted by her tragic death. But, considering she already try to commited suicide twice before (Info from Rob's website), I thought she was a very sensitive person, who could not handle her problem alone. Unfortunately, going to a shrink was not common in the 80's for a Asian people back then. It's very sad. But it also why we always remember her. Hi Jacki and Surya, thanks a lot for your comments. I do agree that, had it been the 21st century, Barbara's death might have been prevented just because of the much larger safety network around now (despite internet also adding to depression to many).